There had been some speculation in the time since the California state legislature passed legislation to move up the Golden state presidential primary for 2020 over whether Governor Jerry Brown (D) would sign the measure. That speculation ended barely a week after the legislature wrapped up its session by passing the primary bill. Brown signed the bill -- SB 568 -- and in the process, moved not only the presidential primary into March but the statewide (midterm) primary as well. Much has already said about what this move means. It means California shifts up 91 days on the calendar; bigger than any move during the 2016 cycle, and that the Golden state is joining an already crowded date on the 2020 calendar. Texas, Virginia and Massachusetts among others have been stationed there since at least 2016. For more about what the move means, and perhaps more importantly, what it doesn't, please see our earlier primer on the subject. The Democratic National Committee Unity Reform Commission recently reconvened for its third of four meetings.1 On the agenda were caucuses, support for state parties and superdelegates. If you had told me heading into the meeting that superdelegates were going to be one of the topics -- even one of many -- then I would have assumed that superdelegates would have been the point of controversy coming out of the meeting. And that assumption is not without a foundation. The unpledged delegates in the Democratic presidential nomination process were a wound reopened in late 2015 and one that continued to fester not only throughout primary season, but into and beyond the national convention in Philadelphia. Ripping that particular scab off, then, would, it stands to reason, reanimate those divides within the party. But that is not what happened recently in Chicago. And there is a reason for that. The Unity Reform Commission was chartered in Philadelphia with the express purpose of reexamining a number of items within the nomination process. Most of that was open-ended. The Clinton campaign and its proxies took issue with, for example, the caucus process, and those affiliated with Sanders had concerns about, say, how the party was reaching out to unaffiliated voters. The URC was tasked with working together to discover, devise and recommend any changes to the rules to address those issues (if the need was pressing enough and/or if consensus could be built). However, there was little guidance in the charter as to the shape those recommendations would take. That was not the case with respect to superdelegates. The task there was more defined and much less open-ended. In other words, there is a specified recommendation the URC has to make via the charter on superdelegates; to trim their ranks by roughly a third by pledging DNC members based on the primary or caucus results in their home states. That, in turn, has the effect not of limiting the discussion on the place of those unpledged delegates in the process, per se, but rather, putting in place a floor on the discussion where one does not exist on the other matters. The URC, then, could go beyond that mandate for a recommendation, but could find it difficult to find consensus (and/or design an alternative that would pass muster with the Rules and Bylaw Committee much less the full DNC). Regardless, superdelegates were not controversial (or any more than they already were) coming out of the meeting. Strangely, caucuses elicited the biggest response. And to be clear the controversy was mostly external to the URC meeting; more in reaction to the topic discussion than anything else. Again, this is unusual. The Democratic National Committee is limited in what it can do on caucuses. As the Unity Reform Commission heard in their first meeting in DC, primaries are mainly state-funded, giving those state governments some limited input on matters of scheduling and participation. There are state party-funded primaries, but they are exception rather than rule and have mainly died out. 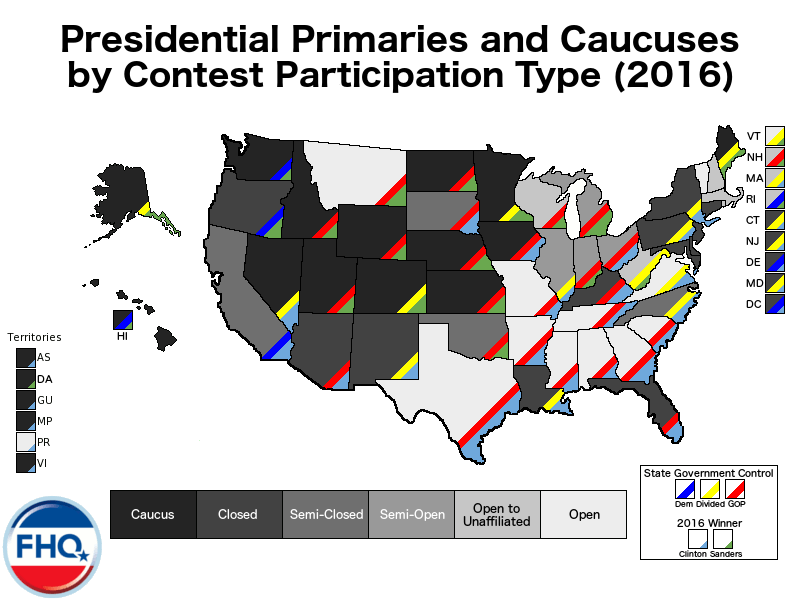 Both South Carolina and Utah have had party-run primaries as recently as 2004, but if a state is not funding a primary, then caucuses have become the default alternative. Indeed, that is an important point. Caucuses, to the extent they remain in the current context, are a function of, in most cases, a lack of a state-funded primary. Of the 14 states -- not including the territories -- that had Democratic caucuses in 2016, 11 of them were in states where there is no state-funded primary option. 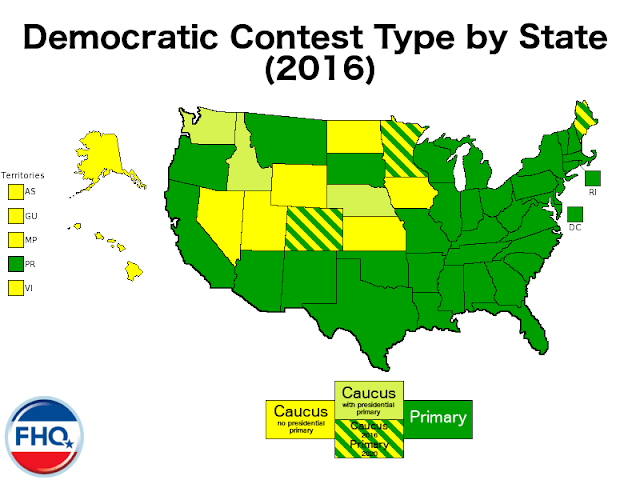 Only the state parties in Idaho, Nebraska and Washington -- the states in lime green below -- opted out state-funded primaries for the most recently completed cycle. 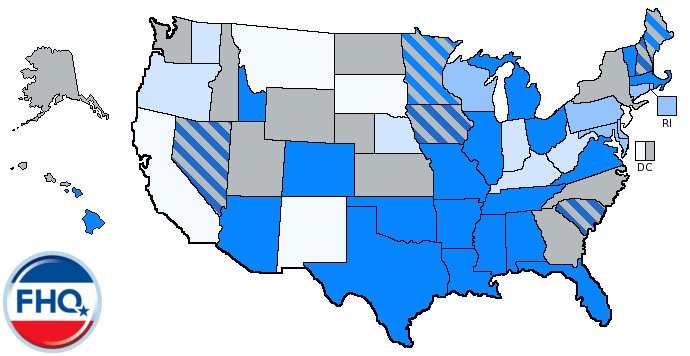 Furthermore, if one overlays the recent open primaries map (below) on top of the remaining yellow states on the map above, the picture fails to clear up any further for Democrats. The important thing to eye there is the stripe denoting partisan control of state governments. In only Hawaii and Washington are there unified Democratic state governments that could, if they were so inclined, shift from a caucus system to a primary. And obviously one of those states, Washington, has seen its state Democratic Party opt out of the state-funded primary since it was brought into being by ballot initiative in 1989. In each of the seven intervening cycles, Washington Democrats have chosen to record presidential preference and select national convention delegates through a caucus/convention system. Elimination of caucuses, then, does not appear to be in the offing in 2020 and beyond. Unless the DNC is willing to pony up or state parties raise the cash necessary to conduct party-run primaries in states where no state-funded option is available, then caucuses, for better or worse, will be a part of the presidential nominating process. And while it is true that caucuses are not going anywhere anytime soon, they have gradually dwindled in number over the course of the post-reform era. Primaries have proliferated as the main means of presidential preference expression across the nation since 1972. 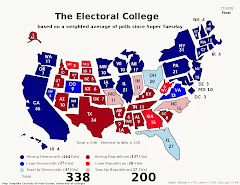 Then there were only 22 primary elections. The remainder were caucuses. In the time since, the balance has tipped and even more decidedly toward primaries. 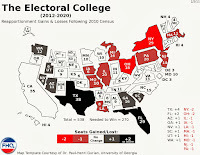 Not counting the territorial contests in 2016, there were, as was mentioned previously, just 14 caucuses left in mainly small and medium-sized states. That number will be scaled back even further in 2020. Already Colorado, Maine and Minnesota have made moves to add state-funded primary options for the next presidential nomination cycle. And in the latter two, the state parties have a say in the date selection for the primary and thus have incentive to opt in. In Colorado, the state parties are structurally hemmed in by the new law and national party rules and likely have no other recourse but to utilize the primary for delegate allocation. That leaves just 11 caucus states at this point in 2017 for 2020. 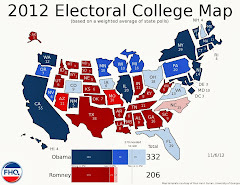 And other than Washington, the remaining caucuses are in small states. None have more than four members in the House. Participation rates in caucuses, though reduced by comparison to primaries, are reduced by less in small states than in large states. Those are all steps in the right direction for those who are proponents of scaling back or eliminating caucuses. The reality is that this is much like the Democratic Change Commission (DCC) deliberations on the caucuses subject. Minus funding, the most feasible path is through a tweaking of the processes and the development of what the DCC called "best practices," a more uniform process across states. That remains the most likely URC outcome/recommendation where caucuses are concerned. 1 A fifth meeting has now been added for December, one that will, no doubt, be utilized to finalize the recommendations the URC will pass on to the Rules and Bylaws Committee. For much of 2017, there have been a couple of bills working their way through the California State Assembly to change the date of the presidential primary in the Golden state. And for much of the year both have been on a bit of a collision course. Both have made it through their originating chamber, but the bills differ from one another, requiring some reconciliation at some point. That reconciliation came as August came to a close last week. The crux of this is that the Senate-passed bill called for the continued consolidation of the presidential primary with the direct primary for state and local offices and moving that combined primary from early June to the third Tuesday in March. Additionally, the legislation would have given the California governor the power to shift that consolidated primary up even further on the primary calendar than the newly called for March baseline. Alternatively, the Assembly took a simpler path, more consistent with the way in which other states tend to move their primaries around. Again, the budgetary constraints placed on the state almost require the presidential and direct primaries to remain consolidated. A separate presidential primary election would cost the state more than $100 million. But the Assembly bill would leave the direct primary in June in midterm election years while shifting the consolidated primary election up to the first Tuesday (after the first Monday) in March in presidential years. In the end, there were atypical aspects to each piece of legislation. The staggered result of that Assembly bill (AB 84) -- a March primary in one year, and a June primary in another -- is exception rather than rule in most states with consolidated primaries. Alabama and Mississippi stand out as states that have a similar, on-again-off-again approach, but again, most states -- Illinois and Texas among them -- with consolidated primaries tend to be more consistent, holding them at the same calendar point regardless of the what office is at the top of the ticket in a given year. On the state Senate side, the uncommon provision in the bill (SB 568) was and has always been the additional power granted the governor to shift the primary to an even earlier date than the new third Tuesday in March baseline. It was always poorly designed. Basically, the earliest the governor could realistically schedule the primary was for the first Tuesday in March. There is more to it than that -- which interested readers can dig into here -- but that essentially powerless power ceded to the governor would only really give the executive in the Golden state the ability to move the primary to a point on the calendar where Assembly bill would already move it. But as of August 31, those complications are gone. First, the Assembly bill was pulled off the active list in the Senate and the gubernatorial provision was removed from the Senate bill. What is left is a piece of legislation (SB 568) that would push the consolidated California primary election up from the first Tuesday (after the first Monday) in June to the first Tuesday (after the first Monday) in March. That calendar position would be used in both presidential and midterm election years starting in 2019, eliminating the staggering of the Assembly bill. The amended Senate bill will now go on the calendar for a final vote in the Assembly and have to return to the Senate for consideration there before moving on to the governor for signature. 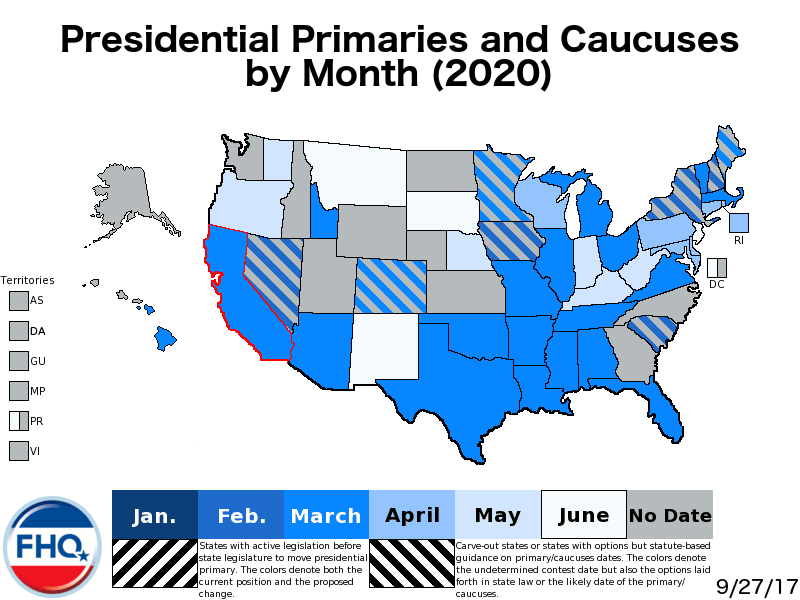 With a uniform date now settled, California's potential impact on the 2020 presidential primary calendar can be more clearly discussed. As outlined in previous posts in this space, the proposed shift would move a significant chunk of delegates from late in the calendar to the earliest spot on the calendar after the four carve-out states. Such a cache of delegates moving to the beginning of March would shift up the point at which half the delegates will have been allocated in both parties by about a week depending on how other states react between now and 2020. First, though, California has to move its primary. And that will likely take more time as the remaining Senate-passed (but now amended) bill continues its path through the legislative process. A tip of the cap to Richard Winger at Ballot Access News for passing along news of the amendment to FHQ.